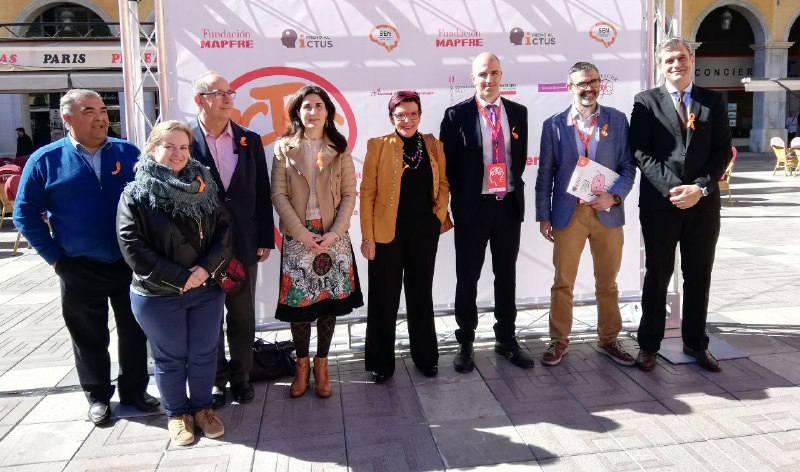 Fundación MAPFRE, The Spanish Neurology Society and Stop Strokes have launched the “STROKES: Prevent, learn, act” campaign in Almeria, to raise awareness in society of this disease. These are some of the figures mentioned today during the presentation of the “STROKE – Prevent, learn, act” campaign in Almeria, based on the latest data from the Spanish Neurological Society (SEN), an entity which, together with Fundación MAPFRE and Stop Strokes is promoting this initiative, also supported by the Andalusian Government and the Almeria City Council. Their goal is to inform society about what a stroke is, what the risk factors and symptoms of this disease are and what to do to suffer the least damage possible from it. Raquel Alcalde, Project manager at the Asociación Freno al Ictus and one of the organizing entities of the campaign, pointed out that this program seeks to “get out on the streets and raise awareness and teach the general public about this disease and its after affects, in order that people know that 90% of strokes are preventable, that it is not solely an elderly person’s disease and that learning to recognize and act quickly if someone has a stroke is the key to preventing serious consequences”. During the ceremony, the Andalusian Government’s Territorial Delegate of Health and Families, Juan de la Cruz Belmonte, took part and discussed how stroke symptoms usually present themselves “suddenly and unexpectedly” and the most typical ones are difficulty speaking or understanding, sudden loss of strength or feelingin a part of the body and the distortion of facial symmetry as well as vision problems and an intense headache. He also emphasized that “the vast majority of patients usually have a combination of various symptoms and merely suffering from one of them, even if the symptoms are reversible or fleeting, is an emergency situation”. High blood pressure diabetes, high cholesterol levels, smoking, obesity, heart problems, a sedentary lifestyle and drinking alcohol, among others, are risk factors when suffering from a stroke. Ageis another risk factor, given that the risk of suffering a stroke increases from the ages of 60-65 although “it can occur at any age”, according to María José Torrente, president of BraDa, who also underlined that “in the last few years the incidence of strokes in young adults has increased considerably, owing in large part to lifestyle choices”. “90% of the cases of strokes could be avoided with suitable prevention measures”. These were the words of Óscar Pizaco, from Fundación MAPFRE’s Health Promotion Area, who pointed out that “when we discuss prevention we are addressing both those who have not suffered a stroke at this point, with measures such as making healthy lifestyle choices, as well as how to avoid having another stroke. If you have already had a stroke, this is a risk for having another one”. Among the measures for preventing strokes, Picazo emphasized the importance of “having a healthy lifestyle, which involves giving up smoking and alcohol, losing weight, reducing salt intake and fatty foods, doing exercise and making a habit of having regular medical check ups and controlling blood pressure. Rafaela Abad, Family and Equal Opportunities Council Member, stated that “Training and informing people about how to be healthy is a very positive activity to undertake. Providing the general public with the right information is the most suitable way of bringing about prevention, teaching how to recognize the signs, and learning what to do when faced with the sudden onset of symptoms. Initiatives such as those promoted by Fundación MAPFRE, the Spanish Neurology Society and Stop Strokes can educate us on how to minimize the risks of a disease from which none of us are exempt. “Brain damage caused by a stroke greatly depends on how long the condition lasts and which areas of the brain were affected. Therefore, being able to identify the symptoms in order to get to hospital as soon as possible can significantly improve the severity of this disease”. This was pointed out by the Patient Care Director of EPES 061 in Almeria, José Javier García del Águila, who referred to one of the campaign’s slogans, “Run.<0> Every minute counts” in order to stress that one of the keys to successfully dealing with a stroke is the speed at which the initial symptoms are recognized and the emergency services are contacted. The other key factor is, undoubtedly, prevention. Together with the entities collaborating on this campaign, Fundación MAPFRE has set up an inflatable marquee in a semi-circle shape, to imitate the shape of a brain in order to serve as a way of drawing people’s attention to the high number of strokes and raise more awareness of the importance of acting in time and knowing what symptoms to look out for. Experts from the Grupo Provincial de Ictus (Provincial Strokes Group) of Almeria, and the EPES 061 emergency services will explain to the public in attendance about how to take care of your brain, and what signs mean we need to act fast and what the Código ICTUS (STROKES Code) consists of. The marquee is open to the public from Thursday 28 February until today, 1 March, from 10am to 8pm, on the Rambla in Almeria.